Most of us remember “the most wonderful time of the year” with fond memories. As the years pass, we fall into the stress-filled dread of making a Pinterest-perfect holiday and are left longing for the days of joyful anticipation during the last months of the year. The joy that traditions bring comes from simplifying our celebrations. Slow down and cherish the love that surrounds the holidays. “One reason so many of us love the idea of an ‘old-fashioned Christmas’ is because our lives seemed much simpler then, and the joys of Christmas were simpler as well,” says Glenda Lehman Ervin of the iconic Lehman’s retail store, and a self-confessed Christmas connoisseur. Evoking the simple joys of Christmas’ past doesn’t have to be a complicated affair. Lehman Ervin says, “Few of us have time for all the elaborate traditions, but by choosing some pleasant, sustainable ones, you can create the Christmas atmosphere without the holiday stress.” Lehman Ervin recommends creating the Christmas atmosphere with a few holiday home decorating touches that appeal to multiple senses. What is more satisfying than the sight of Christmas? The beautiful evergreen covered in lights and strung with popcorn brings all the feelings of Christmas. The wrapping of popcorn strands around the tree is an age old and simple tradition. You and your family get to snack on the extras as you string, and it will leave your home with the delicious sent of fresh popped goodies. Speaking of filling your home with the comforting smells of Christmas like fresh baked cookies, fruit cake, bayberry and evergreen, choose Christmas décor that appeals not only to the eyes but to the nose as well. Drape fir branches, tied with a red bow, above a doorway. Place bayberry scented candles in your windows. Bake some cookies and have your family help decorate. There is comfort in the sound of children’s laughter, and squeals of glee on Christmas morning. However, decorating your home with a few traditional toys prior to the holidays can help keep them laughing right up to the big day. “Think of toys that are simple – things that you might have played with as a child, like a wooden doll bed or a toy tractor and trailer filled with little animals,” Lehman Ervin says. “Anything you use to bring Christmas to your home can also bring the spirit of the season to your friends, far-off family and business associates,” she notes. Send them a pillow for Christmas dreaming, send them the gift of popcorn to enjoy, or a firewood carrier to bring the scent of fresh cut wood to their home. “Giving a gift of a simpler holiday also tells the recipient that you really put some thought into their gift.” After all anything can be a gift when there’s thought and kindness behind it. 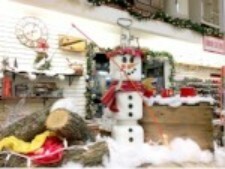 You’ll find comforting buckwheat and down feather pillows, sustainable wooden toys, satisfying Amish popcorn, understandable firewood carriers and more traditional and simple Christmas decorating touches to cherish at www.lehmans.com.